Geeks Toy is a piece of trading software which allows you to trade on Betfair Exchange using additional tools. There are also versions of Geeks Toy for Matchbook and Betdaq which are available completely free but come with limited features compared to the main package used for Betfair Exchange. The history of Geeks Toy dates back to 2007 when the founder noticed an absence of quality trading software. Two years later he released his software which gained immediate attention and grew to become the most used trading software for Betfair Exchange just three years later. Start your 14 day free trial of Geeks Toy now. Using a specialist piece of trading software such as Geeks Toy has it’s advantages over trading directly through Betfair Exchange. First of all, Geeks Toy processes data much faster than Betfair’s website does by taking advantage of Betfair’s API. Users are able to adjust the refresh time which means that the latest trading data is available to you before other traders. Another advantage is the presentation of that data. Data is the key when it comes to trading and Geeks Toy allow users to view more of it than available directly through Betfair. Users are able to customise the visualisation of the data through grid and ladder interfaces and view liquidity on more price points. If you want to be a successful trader then you have to act fast at the right time as profitable opportunities can come and go in a flash. Geeks Toy provides one-click betting which allows you to take advantage of these opportunities immediately when they arise. Geeks Toy isn’t just aimed at pro traders as they also cater for users wanting to learn trading. To do this, they provide a range of training via a series of articles and videos aimed at beginners. The training is very user friendly and presented well in 12 different sections. The training covers everything from backing and laying bets to using and making the most of the features on Geeks Toy. You can download Geeks Toy and try it completely free for 14 days. This should give you a feel for how the software works and enough time to test the features. Following your free trial, there are two subscription options. The quarterly package works out at around £0.22 per day and the annual package just over £0.16 per day. I’m sure you’ll agree that if you’re serious about giving trading a go, 16p per day seems like excellent value. The multi bet tools is especially useful for dutching horse races as it allows you to place multiple bets simultaneously with the click of a button. There can be issues when dutching manually should the odds change between placing bets. The multi bet tool eliminates that problem allowing you to place back or lay bets at the intended prices all in one go. Every trader will have different preferences when it comes to visualising data and Geeks Toy provides great customisation for this with its advanced charting. You can have up to three separate sets of advanced charts, each set with its own configuration options. This is a great feature which lets you trade with play money. This allows you to get used to the interface and features without the fear of making a costly error. With Geeks Toy, you’re able to trade more than one market at a time. This can be extremely useful in many circumstances. For example, you’re able to view the Win and Place markets simultaneously for a horse race. How many markets can you view at once? As many as you like! As well as being able to view multiple markets simultaneously, you’re also able to locate markets in a flash. Handy for trading opportunities which affect multiple markets. In-play trading is very popular and Geeks Toy provides a unique and user-friendly tool to assist in these markets. View the entire market and place your bets with a single click. As mentioned above, Geeks Toy provides a range of well presented training on both general trading and for using the software. However, new users are likely to have questions which is where the Geeks Toy forum comes in. The Geeks Toy forum contains tens of thousands of posts from users and staff members covering a range of topics and subjects such as support queries, announcements, industry news and trading strategies for individual sports. If you have a question, it’s likely that it has already been asked before and answered in the forum but if not, the forum is very active and you should receive a prompt reply. Geeks Toy shows it’s full potential when used with Betfair Exchange. However, there are also separate versions of the software available for Matchbook & Betdaq which are available completely free. 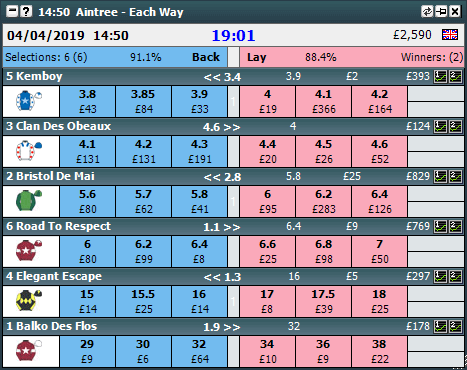 The Matchbook & Betdaq versions are trimmed down in terms of features but they still provide a good base for alternatives to Betfair trading. You can download Geeks Toy for Matchbook & Betdaq via the buttons on the Geeks Toy homepage. Geeks Toy is an extremely powerful piece of software for trading and comes at a very low cost compared to some of its competitors. The interface may seem confusing at first but the training and support provided by Geeks Toy is excellent and should help you get up and running and placing your first trades in no time at all. If you’d like to see what Geeks Toy is all about, you can take advantage of their 14 day free trial.you’ll have access to all of their training and be able to trade for free using the practise mode should you wish.